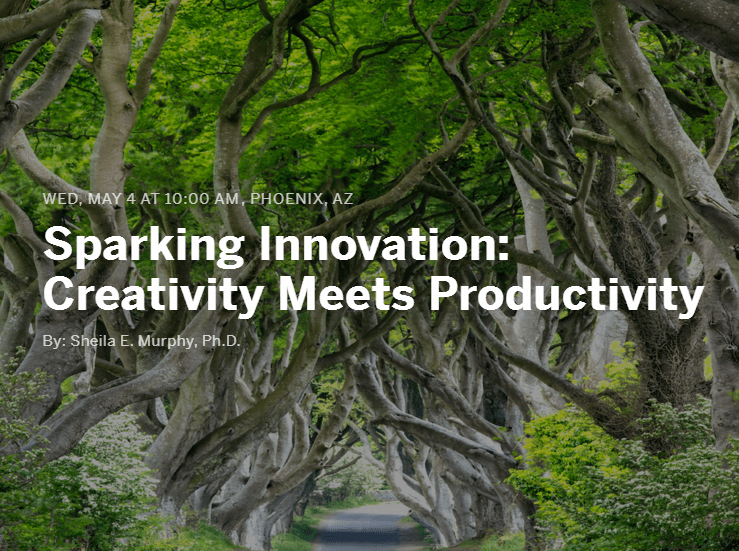 Join Dr. Sheila E. Murphy at the Phoenix Art Museum on May 4th from 10AM – 11:30AM for a workshop on sparking creative business productivity. Business people are legendary at productivity. They work fast, build things, power the bottom line with and through people. Artists are known for creativity. They invent, they craft, they build new pathways. In private business and public service within this global economy we can all become more innovative. Given the issues we face, complex solutions are required. Our world is beginning to depend upon them. The very innovation needed by corporate and artistic people alike begins when creativity and productivity come together. What if there were a way to learn how to become innovative, using both of these critical halves of yourself? What if you could develop your creativity and enhance your productivity? And what if you could learn how to access that fluency at will? Event ticket price includes FREE entry to the Phoenix Art Museum following the program. For more information about purchasing your ticket, view the Eventbrite website. Dr. Sheila E. Murphy has “double majored” in the arts and business throughout her career. As a prolific and award-winning poet, a working artist, and a trained musician, she has led a highly successful consulting practice in business for more than 30 years. Dr. Murphy has served in executive positions within the private sector, in addition to publishing more than 30 books of poetry. Her visual art has been shown exhibited and hangs in private and public collections. Her flute performances have been a major part of her life. Dr. Murphy also studies history, philosophy, and literature as a source of primary knowledge.